1. Microwave the spinach in a large bowl covered with clingfilm for 1-2 minutes until wilted, press out excess liquid. 2. Heat the oil in a small frying pan and fry the pine nuts for 1-2 minutes until golden. Whisk together the eggs, milk and ricotta, keeping some lumps. Season, then pour into the pan. Cook for 3-4 minutes until just set. 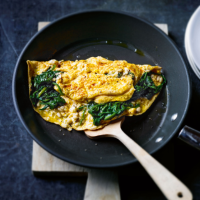 3.Top with the spinach and nutmeg and transfer to a plate folding over the omelette. Serve with salad.